I have indeed selected the larp that stems from the Jeepform tradition, and is categorized by its writers as part of a burgeoning self-defined style called American Freeform [Larp]. The use of the term “larp” to describe it is under debate by the community (see Lizzie Stark’s post), but in the largest genre sense, it definitely is larp — live, embodied players taking on roles and enacting a particular scenario using rules/mechanics and techniques for the purpose of exploration and fun. (Truth be told, the use of the term “freeform” is also contentious, as is the word “American”, but such is larp.) But the American Freeform style takes table-top as a closer progenitor (much like most US larps, as opposed to their European, especially Nordic counterparts), and borrows from the table certain meta-techniques that carve the larp into clear scene breaks and acts, something considered sacrilege to those who espouse that “true larp” is immersive and continuous while in game. Read Evan Torner’s manifesto to learn even more. The focus of this study will not be whether American Freeform (or Jeepform for that matter) is larp; rather, I will look at the specific meta-techniques outlined by a particular American Freeform game, Play with Intents – -Noir Version. (You can read the system here: Last Chance Noir). According to one of the authors, Emily Care Boss, “Freeform meta-techniques are procedures which interrupt into the flow of the narrative, but which give players access to additional layers of storytelling and embodiment of character.” In this sense, the techniques make for a constantly changing activity system that moves between and among the players and techniques, and among the layers of role-play in-game/out-of-game, in-character/out-of-character, social norms, tropes, motivations, etc. The game is set up for maximum flexibility and is dependent on the players adaptability to change to keep the narrative moving. I want to take a look at these meta-techniques as creating the protocols and boundaries for the larp to unfold. 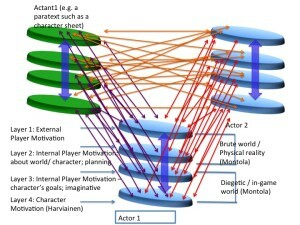 Each of the techniques functions as a node in the network, and can be called upon at any time during a scene by a player or the GM. I think this particular larp style will work will for Actor-Network Theory, and the actants and actors and various types of agency. In addition, this role-playing style is less about simulation and more about making use of what is available — a dynamic network is created through player/GM-chosen protocols and sustained for the duration of the game. This form is more fluid between in-game and out-of-game, which is why the techniques are called meta-techniques. In addition, individual players have more agency to “direct” the action and control the flow, which to some traditional larp players can feel like less autonomy over their own characters. Costumes (which are far less elaborate than in a traditional larp) are created on-the-fly and are “suggested” via props, often taken up spontaneously. These features, along with the form’s obvious nods to the table-top and Nordic traditions make for an interesting ecosystem and ANT approach. I also envision analyzing the affordances and constraints of each technique individually and how they work to an accumulative system. To give an example, one of the Nordic larp techniques that is incorporated into is Monologuing, known in the American Freeform Play With Intent – Last Chance Noir as Inside/Outside Voice. Using this technique a player alternates between character’s inner voice and external narration/dialogue. Players are directed to “Speak interior thoughts other characters would not perceive. May also speak broad connecting information, like a narrator’s voice-over in a film, that fill in pieces of the puzzle or push the characters in new directions.” This gives information to the PLAYERS that would not be known to the CHARACTERS, and is a method of information control in the game, especially as a character can be directed to give a monologue by another character or the GM, whenever s/he is interested in learning the motivation or thoughts behind an action, or to reveal information that would demonstrate a central tension or character trait. This OOS is important to English studies because it represents a form of collaborative composition and interactive narrative. Using techniques, not unlike writing tools and rhetorical moves, players jointly compose. The GM behaves much like a teacher by planting the seeds, gathering the components, and regulating the action, but also letting it unfold. It models a kind of creative problem-solving that we wish to include in classroom spaces. Furthermore, it is a site of cultural production that makes allusions to literary and historical pieces, adopting tropes from literature and theater. In addition, as these larps are remediations from movies or table-top games, they offer interesting insight in terms of genre study. I am lucky to be in contact with four of the major players in American Freeform: Lizzie Stark, Emily Care Boss, Evan Torner and John Stavropoulos. I have played two of these games in the past six months, and read many others. I also participated in a workshop about the techniques at the Living Games conference in New York City last month, conducted by Boss and Torner. Boss, Emily Care, and Matthijs Holter. Last Chance Noir: A Play With Intent Tool Kit. 2014. Stark, Lizzie. “Introducing American Freeform.” Lizzie Stark. Web. 28 Mar. 2014. Stark, Lizzie. “Jeepform for Noobs.” Lizzie Stark. Web. 28 Mar. 2014. Torner, Evan. “American Freeform: A Transatlantic Dialog.” The Guy in the Black Hat. Web. 29 Mar. 2014. Torner, Evan, and Emily Care Boss. “Transforming the Narrative: Freeform Meta-Techniques.” New York, N.Y: N. p., 2014. Print. They are not eclogues. They are ecologies. * The title refers to my misreading of the title of Guattari’s book multiple times on my bookshelf, so many times, in fact, that my brain has inscribed it as The Three Eclogues. He can sit next to Virgil on my shelf. One meaning of eclogue is a “draft” or a “reckoning” so perhaps I’m not too far off, at least in terms of this post, or of a theory of composition. So, I’m picking and choosing and synthesizing among this week’s reading about ecologies and ecosystems. Some of the texts are explained literally in terms of eating and pooping, and while that is interesting (as is the rate at which the speaker speaks in the video posted … wow. Can’t read a teleprompter that fast, can you? It must be accelerated in post-production … reminds me of my favorite YouTube channel, PBS’s IdeaChannel, but he also talks fast, so maybe this is a post-modern ethos and we really can listen and absorb that quickly, which makes me think about those speed-reading programs (like Spritz) that purport to elevate your reading speed to more than 500 words per minute by lining up the words, one at a time, at the optimal recognition point , which I would like to be able to use for this week’s reading, which seems excessive, but possibly I’m just jaded after finishing a case study and last week’s asynchronous work, as well as being tired after attending a conference and being behind on … well…. life**), I’m more interested in the metaphoric application of an ecosystem to my object of study, or to writing, as Peg Syverson does in her book, The Wealth of Reality. **Did you read the parenthetical maroon textreally quickly, staccato-style, imagining quick edits and zooms? It was intended that way. Anyway, Guattari, the Cary Institute and the Ecological Ecosystems Crash Course are all talking about webs of interdependencies of multi-variate organisms co-existing in nested complex systems that together, create an über-ecosystem we might call “life on earth.” Ecosystems are ways to explain things that are dynamic, in a state of flux, and whose outcomes/outputs cannot be fully predicted mechanically (or, I would add, computationally or logarithmically, even as our AI gets ever more complex and interwoven into the system). An ecosystem’s concern with distribution, flux, exchange, and transformation by invested adaptable members who are co-creating the system makes sense to view as a network, at least a very complex one, such as my object of study, larp. Computer networking and encoding seems to be to take as its object a replication of such natural world complexities and systems, in an effort to more closely map and mimic (and plan and influence) our quotidien life. Indeed, members of an ecosystem appear to continually assess its affordances and constraints, with their own survival and needs as paramount. Ecosystems can be measured in terms of their abundances and their efficiencies. Ecologies promote synthesis and integration, rather than fragmentation (Cary Institute); an ecologist is a “synthesis scientist” (Spellman). In fact, Spellman weaves in and among literature, poetry, art, parables, government statistics, and scientific inquiry to illuminate the concept of ecology; his chapters themselves are ecologies of texts. Ecology [like rhetoric] has its roots in ancient Greek philosophy and the founding of the Western Tradition, fell out of fashion, and had a resurgence with the Enlightenment focus on scientific inquiry in the 18th century. The word “ecosystem” is more modern, coined in 1935 by Brit Arthur Tansley and adopted by Eugene Odum, the “father of modern ecosystem ecology” (Spellman 12-13). Ecologies are fundamentally concerned with what is produced, consumed, and wasted. Another way of saying this is what is created, transformed, and dissolved. Ecologies are fundamentally dynamic networks in that they exist only in the relationships, in the movement among the nodes, which operates according to protocols unique to each member, but translated into a working, mutually beneficial partnership. Odum refers to an organism’s niche (which hearkens back to the affordances reading of Gibson) as its “profession” (Spellman 15) which has interesting rhetorical implications related to “job” and “work” and “membership” that might be fun to unpack later. Spellman says that homeostasis is a prerequisite for an ecosystem to exist, but Syverson problematizes this to a post-modern sense of stability as existing in a particular temporo-spatial reality and according to prevailing exigence (rather than as a stable “unity” without the system itself). Guattari’s notion of combining levels of ecologies to include attitudes and beliefs and social dynamics, rather than mere material goods is very useful when looking at rhetoric, which seeks to change such beliefs in order to change behavior. I’m beginning to wonder if the three ecologies can comprise the rhetorical triangle, or a kind of three dimensional rhetorical situation, whereby action in one ecology crosses into another (the effect on the situation). Calling it an ecoSOPHY puts more emphasis on the knowing, and the wisdom, the “house-wisdom”, or the idea of, perhaps, the confluence of ontology and epistemology that becomes “common knowledge” or “conventional wisdom”, which can be the hardest to defeat in an argument. 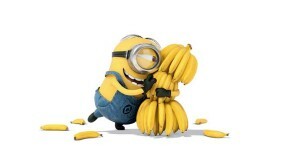 AND …. I now have my Case Study #3: an analysis of the affordances and constraints of the American Freeform Larp, Play With Intents techniques in creating the ecological ecosystem of its larp. Can I just say how much I enjoyed Syverson? Want to read that whole book. When the Doctor picks me up in his Tardis and takes me to the future, that is. “Definition of Ecology.” Cary Institute of Ecosystem Studies. N. p., n.d. Web. 24 Mar. 2014. Ecosystem Ecology: Links in the Chain – Crash Course Ecology #7. CrashCourse, 2012. Film. Guattari, Félix. The three ecologies. London: Continuum, 2008. Print. Spellman, Frank R. Ecology for Nonecologists. Lanham, Md. : Government Institutes, 2008. Print. Syverson, Margaret A. The Wealth of Reality: An Ecology of Composition. Carbondale: Southern Illinois University Press, 1999. Print. Featured Image: A form of the “Flower of Life” hexagonal pattern (where the center of each circle is on the circumference of six surrounding circles of the same diameter) made up of 61 complete circles (making clear the way in which the pattern is constructed). Since only complete circles are used, the full pattern is only visible towards the center of the diagram. Live Action Role-Playing games, or larps, are a kind of role-playing that is done, as its name implies, live, dynamically, with actual people in costume, in physical spaces with props, actively portraying characters and interacting with a scenario and environment. Larps have a rich tradition in communities across the world, with active communities in the United States, Canada, Brazil, United Kingdom, Netherlands, Scandinavia (Denmark, Norway, Finland, Sweden), Italy, France, Belarus, Pakistan, Australia, and others. These communities developed independently of each other beginning in the 1980’s or 1990’s, and have been sharing their history, traditions and practices via the Internet for some time. Recently, cross-pollination of larp communities has begun, as players, storytellers, gamemasters, theorists, and scholars are gathering together at gaming conventions and comparing methods of play. In the United States, Live-Action Role Playing has been abbreviated LARP, with all capital letters to delineate the word’s status as an acronym. However, words that begin as acronyms, such as radar, laser, and scuba, through regular use become recognized as words understood on their own, without reference to their etymology as a shortened form of a descriptive phrase. In other countries around the world, particularly in Scandinavia, where scholarship on larp aesthetics has a decade-long tradition, the word is used as a lower-case word, and not as an acronym. In her 2012 book, Leaving Mundania: Inside the Transformative World of Live Action Role-Playing Games, US author Lizzie Stark chooses to follow the European countries and de-capitalize the word, a move she hopes will “destigmatize the hobby, making it seem less like unrelatable jargon” (Prologue, x). I choose to follow this trend and will use larp as its own word throughout. The word is flexible and is used in many ways in the community: larp can be a verb: Do you larp? Are you larping this weekend? I larped last weekend); noun: I was at the larp in Boston; Monsterhearts is an American freeform larp. It can also be used to describe the player as a larper or the writer of a larp as a larpwright. When I refer to a larp in this paper, I am referring to the action of playing the larp, the larp is it is experienced by the players. 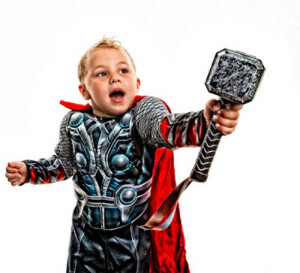 Although the word larp can be used to describe the written text of the game, such as Play with Intent – an American Freeform Larp or Dystopia Rising, a US Boffer larp, I am attempting to theorize larp-in-action – the live notion of Live Action Role-Playing. I am working to understand what happens IN the larp, as the larp unfolds. In my mind the text produced the gives the parameters of the game merely sets up the possibility of a larp; it is not the larp itself, even though it is necessary and convenient to be able to use the word larp in other ways, such as “Which larp do you play? – Dystopia Rising”. The central premise of this paper is to try to theorize the act of larping, a particular instantiation or iteration of a game title. For this paper, I will be focusing on the larp tradition in the United States, which has more discrete ties to the table-top role-playing games of the Dungeons & Dragons tradition. I do not have time to explore the differences in the US and European traditions fully in this forum, but the US games tend to have more concrete rules and mechanics, reminiscent of the table-top tradition. Although most of the larp scholarship has been done in Scandinavia, and uses the Nordic larp tradition as its basis of understanding, I will be focusing on the US larp tradition in this paper. Some theories developed for the Nordic tradition will be applied to the US-style games, while other theories, never previously applied to any larp, will also be explored. Although larps have not been studied by academics in the United States, they have a decade-long tradition of scholarship in Scandinavia, particularly through three researchers at the University of Tampere in Finland: Jaako Stenros, Markus Montola, and J. Tuomas Harviainen. Montola (2003) points out that the concept of “diegesis”, or an objective truth about a fictional world, is important to understand the theory of role-playing. Montola points out that passive media, such as movies, create a single diegesis that is interpreted differently by every viewer (Montola notes that certain movies such as The Truman Show or The Matrix can be seeing as having a layered diegesis, but in general, there is a single fictional world of the work) (Role-Playing 82). He contrasts this with the interactive and participatory medium of role-playing, which allows for a number of simultaneous diageses equal to the number of players in the game: “every participant constructs he or her diegesis when playing” and “the crucial process of role-playing [is] the interaction of these diegeses” (83). Montola notes that these diegeses differ from varied interpretations of a single passive text due to four reasons, but I will focus on the notion that “role-playing diegesis and movie diegesis are different” because of the internal construction of meaning in the players’ heads. This individual diegesis will be personal and based on the interactions had in the game, which will not be the same as those experienced by another player. In addition, these meanings that a player imagines into their personal diegesis may never be communicated in the game, or be imperfectly communicated, either diegetically or non-diegetically. This imaginative and individual meaning-making powerfully affects the construction of the reality, the decisions of the player, his/her interactions, and the experience of the game for the individual, and ultimately for the group, who co-creates and collaboratively interpret the unfolding experience. Italian larpwright and theorist Raffaele Manzo in “There is No Such Thing as A “Game Master” (2011) notes that role-playing games ‘play’ with our “long-lived acquaintance with spectator arts” which humans approach “expect[ing] an author distinct from the audience” (115) While in certain larp traditions, most notably in the US tradition that grew more directly from the Dungeons & Dragons narrated tabletop games, the gamemaster certainly has more of what Ron Edwards calls “authorities”, there certainly isn’t an author or “auteur” proper of an RPG. Manzo agrees with larp author M. Pohjola (2000) who argues that those who wish to retain dramatic and narrative control over their stories are free to write them: as short stories or novels (115). Remediating them into a larp elides the distinction between audience and author and distributes narrative authority among the players who tell the story. However, in some games (particularly US ones), a gamemaster does play the crucial role of “referee”, or, one might say, of a router in a network. S/he determines which protocols to use at a given moment, to translate an object or utterance from a player into the diegesis of the game, or to determine in an “on-the-spot ruling to make up for a gap in the rules” or protocols (113). The GM functions as interpreter and gatekeeper: this belongs in the game, this does not. This will enter the game, but only with these properties, according to these rules and protocols and procedures and precedents. As such, the GM is more than a mere node in the network, possessing greater power than a single ordinary player, and get simultaneously s/he has less power in that s/he is dependent on the ordinary players to create the content that will be interpreted. Larps, thus, are a both a collective authorship within a participatory media as well as a socially contractual activity system with a creative leader who manages procedural tasks to some degree. Montola’s notion of individual diegeses interacting through play to co-create an experience resonates with Foucault’s notion of the post-modern space. He says in “Of Other Spaces” that “[w]e are in the epoch of simultaneity: we are in the epoch of juxtaposition, the epoch of the near and the far, of the side-by-side, of the dispersed” (23). In a larp, different player diegeses are juxtaposed, dispersed throughout a game, experienced simultaneously but not personally. Each person’s game happens at the same time, but they do not have the same game experience, both due to varying physical interactions and the varying meaning-making occurring within their minds. The experience of the larp becomes, as Foucault articulates, “that of a network that connects points and intersects with its own skein” (23). A larp exists in the warp and the woof of the weaving of the game, but without a single weaver; a gamemaster may fancy him/herself as such an omniscient narrator, but, as Montola notes, “there can’t be ‘an objective gamemaster’s diegesis” because the gamemaster is not the sole creator of the fiction” (85). The most power a gamemaster holds is to be the judge when multiple player-character diegeses are found to be in conflict. Even still his subjective view is only partial; s/he lacks access to the imagination of the player. Decisions are made only on what is successfully articulated and communicated, though other meanings are present, and the meaning of the GM’s interpretation will immediately be re-interpreted into the individual player-character’s diegesis, dispersing the moment of convergence almost instantaneously. Montola further notes that larps are a kind of social construction with “intersubjective phenomena” where “[e]very player has subjective, unique, unverifiable, unpredictable, and uncontrollable perceptions of the game state and game rules” (Social Construction 303). However, games should also possess John Searle’s “collective intentionality” so that we can agree that “some things count as other things in certain contexts” and have some shared experience of a fictional world created through symbolic representations (303). Montola notes that the traditional frames for understanding games: objectivist views such as systemic or materialistic, and subjectivist views such as referee-centric, player-centric and designer-centric all fail to understand larps as they are “social systems of meaning-making” (Social Construction 307) where player choices – both conscious and unconscious – influence play significantly. Harviainen goes on to try to account for this multiple layers of diegesis and play through approaching a larp as a Hermeneutical Circle that can be interpreted as a “liminoid, but not truly liminal experiences” (71). 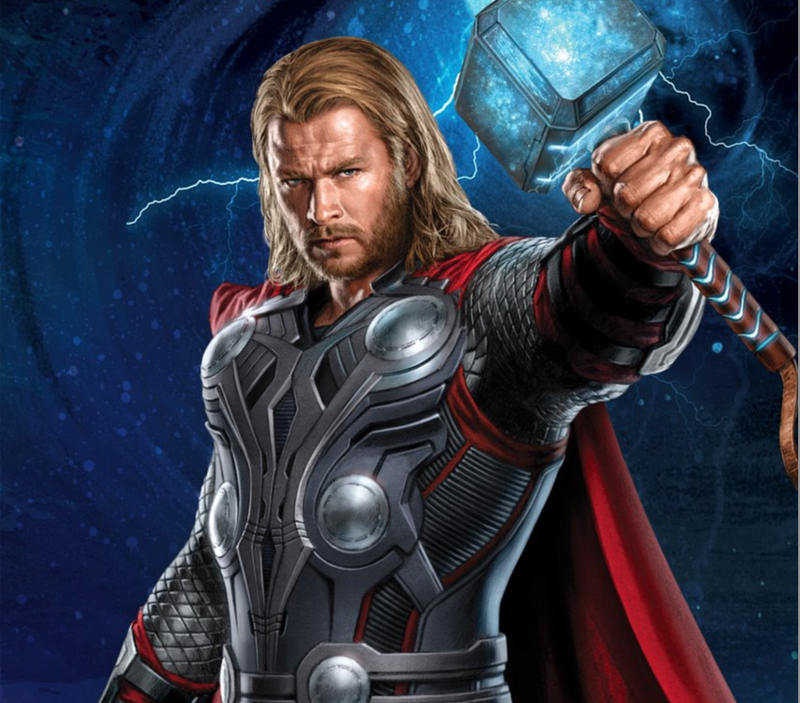 Role-playing cannot be interpreted as a single text due to the variety of player-character diegeses, but “role-playing is never a state of pure imagining, because the player is always connected simultaneously to both the diegesis and the real world” (71). After a discussion of Edwards’ Gamer-Simulationist-Narrativist levels, Kellomäki’s four layers, Fine’s three frames, and Mackay’s five frames, Harvianinen notes that each of these layers, regardless of definition system exist temporarily and simultaneously to create a role-playing experience that “is realized as event but understood as meaning” (Ricoeur 1981) in a temporary social frame (Goffman 1974) which can be read as a layer of text. Hypertext theory, then, may afford some insights into how to read and understand the temporary instantiation of a text that emerges as the role-playing experience. Indeed, I will posit that a larp makes visible what hypertext theory posits; a larp is an embodiment of the abstract meaning-making along the web’s wireframes and enacts the potentiality that early hypertext theorists such as Bush, Nelson, Bolter, and later ones, such as Johnson Eilola and Joyce have celebrated. Hypertext makes readers into writers; it takes a postmodern dispersed subject and re-instantiates it, temporarily, in a co-creative experience manipulating objects, making choices, and creating a narrative by following paths. As Joyce notes, hypertext affords random access to information: “readers access the symbolic structures of a hypertext electronically in any order that they choose” (Of Two Minds 20). He furthers this thought in Othermindedness when he notes the presence of others in the user-reader-writer’s navigation of hypermedia, whereby they “select among possibilities already visually represented for them by successive authors of the hypertext or its previous readers, or they may create new choices by discovering them within, or adding them to, the visual organization of the hypertext” (20-21). In a larp, the reader is the writer is the player, with no real distinction during the game. In fact, a larp can only exist because the players have the agency to become writers; otherwise, as Manzo and Pohjola note, the author would not use the larp medium if s/he wished to retain control over narrative and characterization. The loss of authorial control as discussed in hypertext theory is enacted in a larp since a gamemaster creates an interface by writing characters and a scenario, which gets presented within the limits of a particular space and time. Thus, a larp is, like hypertext, an “ambivalent technology” in which “objects or concepts that can be used in various ways depending in part on the social conditions in which they are constructed and reconstructed in use” (Johnson 23). Like a creator of hypertext, the larpwright may assume a particular flow, but control is turned over to players who interpret and change the order, make dynamic choices, and go unintended places. Montola notes that “while a book is a piece of art we interpret to enjoy, a role-player creates his own piece of art, interpreting symbolic feedback to augment the creation he makes for himself” (85). As hypertext theorists posited an elision between reader and writer, this elision is made manifest in a co-created, though, as Montola notes, not perfectly co-imagined, space. As a non-linear narrative that unfolds in separate pockets, meaning is only made in the interaction between the reader/writer/player, in the kind of hermeneutical interpretation of the text that Harviainen advocates. Despite interacting within the same temporo-spatial physical reality and enacting a given story arc, larps are fundamentally a blending of texts, not a univocality but an intertextuality. The constituent elements of a larp, such as the player-characters, non-playing characters, the gamemaster, paratexts, mechanics, props, costumes, and the physical space, can be seen as nodes within such a network. The game is a manifestation of the constituent elements (nodes) coming together in a particular blend of real and imagined temporo-spatial reality, Johnson-Eilola’s geography and geometry. These nodes exist as an ecology where agency is a possibility — an articulation awaiting action or exigence. They are situated in ways that make them available and accessible as needed. Indeed the game texts exist in the database-like structure of hypertext, as what Johnson-Eilola calls “multiplicities and contingencies and tendencies” (23) that can be “served up” (or refused) as needed by the players. They are situated in absence, only visible if they are both imagined and communicated to others within the game. As Johnson-Eilola notes, there is no “discrete” situation since “the text is no longer a linear or hierarchical string of words.” Rather it is “an explicitly open space of text that can apparently be entered, navigated, deconstructed, reconstructed, and exited in nearly infinite ways” (147). If Harviainen notes that a game experience can be read as a text, then hypertext theory would note that these texts only become actualized through the activity of being contextualized and recontextualized (160) through play. In their enactment they reveal multiplicities, a “play of signification or the deferment of meaning” and an attempt to recapture authorial context, (what did the GM want? Am I playing this ‘right’? Will I break the game’s intent if I do this?) though it will be a co-created reality that cannot approach singular perspective or univocality, as mentioned earlier. This would agree with Montola’s notion of individual diegeses interacting with one another. According to hypertext theory as I am applying it here, in the course of the larp, texts are read (as the text as created). As content is transferred from one place to another (indeed, through and among the many game-frames/layers and texts), a decision is made as to whether that content is relevant to the user/player at that intersection of space-time. Meaning is made by the confluence of the nodes, as interpreted by the user/player, Montola’s individual diegesis. Instantiated networks are brought together solely for a single game, enacted from among the texts presented in the geometry and geography of the physical space. What constitutes the experience or “reading” of a larp is co-created by players and GMs at the moment play begins, and dissolves at game wrap; in the interim it continually grows and changes – is created or remediated — through player interactions. Unlike a fixed hypertext presented through a digital media, intertextualities are constantly shifting as new texts are added and removed from the network, beyond those originally linked by the creator of the hypermedia. Content is discarded after it is used/read/written, but the potential network remains at the end of a larp in its database fields of texts, players, objects, and memories – in the traces – that can be called forth again in various combinations, but never repeated. In Othermindedness, Joyce notes: “I make change and am changed by what others make” (71). This, fundamentally, is the co-creative feedback loop in a larp. Joyce quotes Hélène Cixous: “I didn’t seek, I was the search” (1991 41, qtd. in Othermindedness 73). Joyce explains it as the process or journey of collecting not the sum of the items collected. This is the larp, which is known as it is played but cannot be known by looking at its traces and artifacts. “Hypertext is, before anything else, a visual form. Hypertext embodies information and communications, artistic and affective constructs, and conceptual abstractions alike into symbolic structures made visible on a computer-controlled display. These symbolic structures can then be combined and manipulated by anyone having access to them” (Of Two Minds 19). Larp embodies information and communications, artistic and affective constructs, and conceptual abstractions alike into symbolic structures made visible through the characters and setting present in a controlled physical space. These symbolic structures can then be combined and manipulated by anyone having access to them. Larp is hypertext made manifest at the intersection of discourse and imagination. Like hypermedia, it is located in the liminoid space – Deleuze and Guattari’s intermezzo – between in the brute world of physicality and the fictional world. As players/readers/writers, we are Deleuze and Guattari’s nomads, journeying through the space where reality is a personal continual present in which our agency is manifest, called into being through the immediacy and interactivity of communication between and among networked nodes. Another useful approach for understanding the experience of a larp is Actor-Network Theory (ANT). ANT allows me to see larps for the emergent and dynamic items they are. A larp is not an artifact; it is not revealed by looking at the character sheets and the blue sheets and the mechanics. It is not revealed by looking at the cast lists or knowing the players. It cannot be determined by interviewing the gamemaster. It is only revealed during play, with the particular set of players brought together for that particular instantiation of the scenario. ANT allows me to discuss the instability of the network, the inability to draw or map the movement or activity system of a game, which evolves in an unpredictable, though not random fashion. In fact, a larp is always about to dissolve; it exists in tenuous boundary crossings which are manifestations of player choices based on their diegesis. In fact, Latour describes ANT via a set of “uncertainties,” the first being the idea that there is no stable “group,” only “group formation” (29). By this he means there is no such thing as a fixed entity, only controversies tenuously collected by the people (Latour would call these ‘actors’) doing the collecting at that moment. It is not the project of ANT to “stabilize the social on behalf of the people it studies; such a duty is to be left entirely to the ‘actors themselves” who “generate new and interesting data” by making their performance visible through their inter/actions (31). 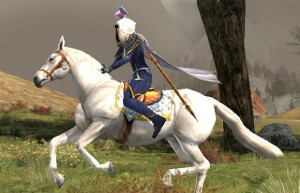 Fundamentally, this helps explain the difference between a larp and a digital video game; a larp leaves the actions and the traces up to the players, while a video game these are encoded and inscribed prior to the game via a designer who seeks to define and stabilize game possibilities. For Latour, boundaries are not fixed, but demarcations of tension, such as that between the imaginative and the physical, or the individual and collective diegesis in a larp. The situation of a larp evolves and shifts constantly, with sub-networks and alliances among players and various combinations of in- and out-of-game information. In ANT a network is not a structure but a set of transformations; the situatedness of the nodes in the network is in constant flux. Clusters of actors come together for a certain time and have both material and semiotic meaning, a duality that corresponds well to the physicality and imaginative spaces of a larp. Nodes may be intermediaries, merely carrying or relaying information between actors, or, more likely, and certainly in the case of a larp, they are mediators, which transform information as they carry it. Their outputs cannot be determined by their inputs. In fact, Latour notes that “Actors themselves make everything, including their own frames, their own theories, their own contexts, their own metaphysics, even their own ontologies” (147). 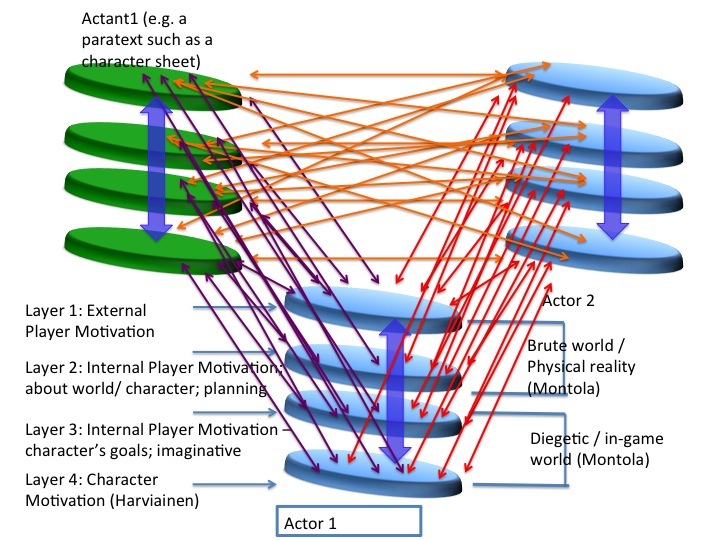 As Montola and Manzo have noted, this describes the process of diegetic meaning-making in a larp, which is highly individualized and exponentialized to include the number of players in the game. ANT focuses on controversies and the connections among nodes as defining a network; indeed games must have controversies to not be stagnant, and plot is a series of conflicts and responses to them. As new controversies emerge, they must be incorporated diegetically and made real; in a larp, once you speak it or do it, it is true and must be justified, sometimes by the GM or by the players as a whole, but in order for the game to continue, the explanation must be agreed upon diegetically. The aberration or deviance must be incorporated (embodied into the world), and the possibilities of action shift as a result. Using ANT allows me to bring into the analysis the variety of items affecting and being affected by the play. According to Latour, “anything that does modify a state of affairs by making a difference is an actor” (71), thus anything that makes a difference to the game or leaves a trace becomes a node. In larp, this can become quite an exhaustive list, since two worlds are “in play” simultaneously: the brute physical world and the imaginative one. 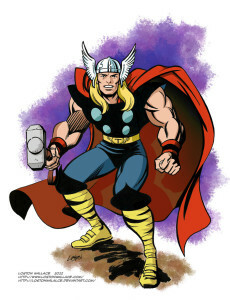 Examples include, but are not limited to: player-character; non-player character, GM, character sheet, blue sheet, costumes, props, genre/style of game, mechanics/rules, card pulls/dice/other interfaces, furniture, room/physical space, venue, player experience as gamer, player knowledge of other players, out-of-game beliefs, out-of-game relationships, player goals, character goals, time, player knowledge of scenario, character knowledge, physical attributes of the player or character (e.g. bodily abilities, stamina, blindness, injury, etc. ), experience of GM, when game was written, number of times game has been play-tested, other games played recently, player/game master expectations, functionality of items in game, etc. Agency in a larp is defined in many ways, which makes sense using the lens of Actor-Network Theory, which divides nodes into human actors and material actants (which are interpreted or defined by the humans). For example, a GM attempts to assign agency to actors and objects by controlling their use, the timing of when information is revealed, who may use items or skills, and how they are used. S/he enacts this agency regulation via mechanics that control information flow and time (e.g. no one can die until the third hour; guns are not live until 15 minutes before wrap; character x has combat rating of 5 while character y has CR of 2). Yet players may not take all of the agency they are given, or they may push for additional agency by arguing for it with the GM or taking it from other actors. ANT helps to describe that in a particular actor-network, not all nodes are used, nor would they be used in the way the GM defined the agency. Agency may also be delegated to others as well as shared, and can be removed at any time by actions by other “nodes.” This shifting, repositioning and redefining is something ANT could account for by considering how a node is temporarily enacted. For ANT, anything social – and a larp, as we have established, is profoundly social – is constantly constructed through complex performances by mediators, who create anew forms and meaning. This is not done in order to give a “true” representation of something else (such as an author’s intent or a repetition of a particular socio-cultural moment, but in order to create a temporary instance that ANT might refer to as a translation. Here is my attempt to begin to map movement of information in an instantiation of a larp, given a particular temporo-spatial reality, a translation of a network. It’s MESSY. What I am attempting to do here is to show that each actant or actor is multi-layered. I am using four layers broken into the two worlds that interact/intersect in larp: the “brute world” of physical reality and the diegetic or fictional world the game. The four layers are a synthesis of Fine, Mackay and Harviainen’s layers or frames, as partially explained by Harviainen in his article cited below. 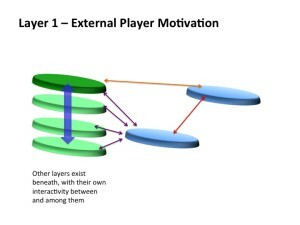 A player-character (or an NPC for that matter), is an entity operating on all four layers, and play moves among his/her individual layers to produce his/her diegesis. The player/character is also interacting with other actors and actants, each of which have the same four layers. Interactivity can occur between and among any of the four layers of each node. I have tried to demonstrate the 3-D nature of an actor or actant, and to show the ability for information, and most importantly, meaning, to go from any one level to another, within and among participants in the network. What the graphic does not show (and I would need a video to do it) is another node joining the network to interact, or one leaving it. In this graphic, there are two actors and one actant behaving as nodes. Each node has the four levels, as explained. Information and meaning can flow bi-directionally between any of the four levels of any of the nodes and within the four levels of a single node. This graphic attempts to demonstrate a single layer, with the other layers beneath it, as one gets deeper into the world of the character’s fictional reality and mindset. Again, information and meaning may move between and among any layer of any node, and within the layers of a single node, which represent levels of consciousness and the movement between in-game and out-of-game. Foucault, Michel, and Jay Miskowiec. “Of Other Spaces.” Diacritics 16.1 (1986): 22. CrossRef. Web. 24 Mar. 2014. Harviainen, J. Tuomas. “A Hermeneutical Approach to Role-Playing Analysis.” International Journal of Role-Playing 1.1 (2009): 66–78. Print. Johnson-Eilola, Johndan. Nostalgic Angels: Rearticulating Hypertext Writing. Norwood, N.J.: Ablex Pub. Corp., 1997. Print. Joyce, Michael. Of Two Minds: Hypertext Pedagogy and Poetics. Ann Arbor: University of Michigan Press, 1995. Print. Joyce, Michael. Othermindedness: The Emergence of Network Culture. Ann Arbor: University of Michigan Press, 2000. Print. Latour, Bruno. Reassembling the Social: An Introduction to Actor-Network-Theory. Oxford; New York: Oxford University Press, 2005. Print. Manzo, Raffaele. “There Is No Such Thing as a ‘Game Master.’” Larp Frescos: Affreschi Antichi E Moderni Sui Giochi Di Ruolo Dal Vivo. Ed. J. Tuomas Harviainen and Andrea Castellani. II: Affreschi moderni. Firenze: Larp Symposium, 2011. 103–122. Print. Montola, M. “Social Constructionism and Ludology: Implications for the Study of Games.” Simulation & Gaming 43.3 (2011): 300–320. CrossRef. Web. 22 Jan. 2014. What Is LARP? How LARPers Define and Describe LARPing. LARP Out of Character, 2014. Film. I made a Popplet to capture the ecologies of CCCC. The conference is NONE of the things above alone. It exists in the relationship between them and the information that flows (and is transformed) among the nodes. As Gibson notes, the more complex the structure, the more it affords. CCCC is very complex, and its affordances are nearly limitless. I have detailed my own diegesis, my own experience of the conference on my Popplet, as well as my own perceived affordances. Someone else, however, would perceive different affordances and have a very different experience, even though we all attended the same conference. There is no one conference narrative, or one way to use or modify the conference experience. It exists, and is there to be co-created by those interacting within it. This is your brain. This is your brain on drugs. Your brain is not yours. You just *think* it is. JJ Gibson’s “Theory of Affordances” set off waves of thought for me in terms of my object of study, Live-Action Role-Playing games. In 1977, Gibson revolutionized the field of evolutionary psychology and systems theory by making up the word “affordance” to explain what something (an object, an environment) offers to an individual. (127). It is a theory that situates itself not in the physical properties of an object, but in the perception of it. Affordances are measured in relationship to the subject doing the perception. The more complex the object and the subject, the more complex the set of affordances, which, Gibson notes, are perceived primarily through optical and sensory information (128). Gibson further defines a niche as a set of such affordances, and he problematizes the subjective-objective dichotomy of thought prevalent in the social sciences vs. the sciences. Affordances, he states, cut across this constructed border and demonstrate its limitations. Affordances exist in the relationship between the object and the user doing the perceiving. This then relates to Bateson, whose theory is about the reality of perception, and how what one perceives becomes what is true, real, possible. This, in turn, leads to Norman, who states that Gibson’s affordance really is a “perceived affordance”; if a user perceives something is possible, then it is possible, if s/he perceives it is not possible, then it is not possible. This is regardless to whether it actually is possible with the object at hand. An affordance isn’t an affordance unless it is perceived by the would-be user. When reading Gibson, I had some ideas about the dangers of perceiving objects solely in terms of WIIFM, “what can be done with it, what it is good for, its utility” (129). This narrow perception can lead to a Benthamite fetishization of utility, and a late-capitalist concern about commodification. Bateson says that what we perceive is difference (differance? ), patterns and ways one thing is not like another. To me that means that our perception creates discourse; discourse is created as a result of perceived difference, of some sort of chasm to cross or something to bridge via language. Perception then, creates the exigence for the rhetorical situation. A rhetor perceives, and interprets, and as Bateson notes, his perception is real and personal, and not absolute. As Gibson notes, what the rhetor perceives are affordances, ways to obtain something from the object or situation, which speaks to Bitzer’s goal-oriented communication, and even to Bazerman’s genres. This perception of “Certain facts” distilled from an object (Bateson 459) is what Bateson calls the extrapolation of information. A rhetorical situation then, affords information. What information is extrapolated and acted upon, then depends on what the rhetor perceives. The discourse that is created then travels along pathways and is “energized at every step by the metabolic energy latent in the protoplasm which receives the difference, recreates or transforms it, and passes it on” (Bateson 459). This relates to the rhetorical situation in that we are measuring the effect on the audience. Furthermore, the perceiver/rhetor, in Bateson’s analogy, adds energy to the object and recreates it into the map of it, into something other than its physical properties. In this way, it resembles the idea of a mediator (rather than an intermediary) from Actor Network Theory. Bateson quotes Jung, who says that “as a difference is transformed and propagated along its pathway, the embodiment of the difference before the step is a “territory” of which the embodiment after the step is a “map.” The map-territory relation obtains at every step” (461). To me, this is demonstrating the iterative nature of the interpretation; as the information is mediated along the pathway from physical object to perceived object, it ceases to be the object itself, but a representation of it, colored by the available information and perceived affordances of the person doing the perceiving. Remembering the object then is an image of the represented image, and further removed from the original object. Any “phenomena” is “appearance”, Bateson says. In other words, all of the world is rhetorically constructed by the seer, who perceives it. themselves, by entering the imaginative space of the game. 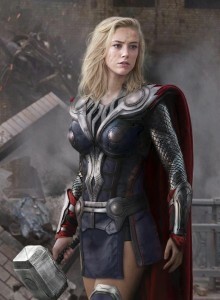 If I am Thor, I am myself playing Thor, the character Thor, all Thors before me – representations that are both there and not there, here and beyond, all working together to recreate, remediate and present “Thor.” When Bateson discusses the “false reifications of the ‘self’ and separations between the ‘self’ and experience’ I am transported to the notion that live-action role-playing is unmediated space; that the self and the experience are one. The play exists in a co-created imaginative space that is experienced through the body; the mind/body split is reconstituted as player. “it is the attempt to separate intellect from emotion that is monstrous, and I suggest that it is equally monstrous – and dangerous—to attempt to separate the external mind from the internal. Or to separate the mind from body” (470). This fetishization of “pure mind” is the idealistic focus of Enlightenment thinking and cybernetic theory, commonly embodied in the person of a digital avatar. Yet in larp, which is face-to-face interaction unmediated by technology, people are liberated by the concept of imagination – of the alibi of portraying a character — that lets them have emotional and embodied experiences in interaction with others in a shared relational ecosystem. There is not difference in perception between character and player in these scenarios. If it is happening to the character, it is happening to the player, whose body is at risk, and whose bodily reactions perceive no intellectual distance between the constructed character and the player portraying. We constitute the reality of the game by “information processing, i.e. by thought” (Bateson 471). As Gibson says, what we perceive is an “ambient optic array” that “at any fixed point of observation some parts of the environment are revealed and the remaining parts are concealed” (136). A larp is only constructed by the person playing it, and one person’s diegesis will be unlike another’s. No one, not even the Game Master or Story Teller ever has all of the information; thus all reality is based on what the player perceives and interprets. Information may exist, a secret may lie latent, but it does not “mean” or “matter” or “exist” in the sense of being perceived as something that can be acted upon until it is seen or heard, and thus brought into the mind of the player and the diegesis of the game. Gibson’s use of the biological term proprioception is fruitful in looking at larp. The notion that “to perceive the world is to coperceive oneself” is a theory of how interactive role play and world building happens, dynamically in the larp. The character is iteratively constructed in relation to his/her environment and to other characters. Gibson goes on to say something that I think can be very useful in studying larps: “Only when a child perceives the values of things for others as well as for herself does she begin to be socialized” (139). This seems to refer to a kind of shared empathy, that is fundamental to the kind of collaborative interactive play that is a larp. Call it the “empathy bump” or “alteric escalation”, if you will. When you realize, as a player, that your experience will be all the richer if you play in such a way as to enrich the experiences of others, then you have a social realm. A network is created by this sort of social contract that recognizes (perceives) the self in relation to others and the affordances of the game as being collaborative and shared. The game exists as a set of affordances in the relationship of the players to the environment and the information. A kind of discursive community, a rhetorical triangle (player – environment – information) is created, and through the act of speaking, the reality is created and perceived. I’m also tossing around this idea that the more divergent the thinking of the perceiver, the greater the number of affordances will be perceived. Thus, the boundaries of possibility – in short, the reality – of something who thinks divergently is much richer than that of someone who thinks convergently. This has implications for the discourse produced. In the case of larps, this affects the outcome of the game, which is only confined to what the player believes is possible for his character within the constraints of the game world and its mechanics. Bateson, Gregory. “Form, Substance, and Difference” Steps to an Ecology of Mind: Collected Essays in Anthropology, Psychiatry, Evolution, and Epistemology. 454-471. Print. Gibson, James J. “A Theory of Affordances. An Ecological Approach to Visual Perception. Boston: Houghton Mifflin. 1979. 127-139. Print. Norman, Don. “Don Norman’s Jnd.org / Affordances and Design.” N. p., n.d. Web. 20 Mar. 2014. 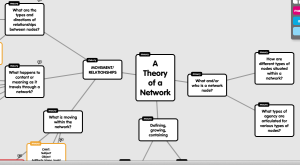 Partial pic of new MindMap attempting to organize learning about Theories of Networks. Work in Progress. Um, yeah. I’d had enough. It was a mess. Time to throw out the old and (re)create the new. I had permission to do so. I am not stuck with the old musings. They are not for naught. They got me to this point. And now I’m leaving them in the dust like the sophomoric musings they are. ANNNNNNNDDDD, I’ll admit it. I drew this on paper first. And then went to the computer screen and the required Popplet interface. I like my pencil to paper. I move quicker. I am trying to decide if this is “preference” or “age.” Or are they synonymous? Hmmmm….. I don’t compose writing from paper and remediate to screen. I write at the computer. I list and I draw on paper. I pre-write on paper. That’s an interesting insight. Pre-paper. Compose-computer. How alliterative of me. The new MindMap is a work-in-progress as I am still reorganizing my thinking around the new nodes. I used the questions from the case studies (modifying one of them) as the main nodes that are defining “A Theory of a Network.” And from those questions, I set up some sub-nodes that further distribute the concept into logical spaces of their own. I then established a color-coded key (which you can see at the top of the MindMap and the top of this post. I combined Foucault with Post-Modernism/Deconstruction and with Hypertext theory as they seem to have some of the same general principles of a lack of origin, defining by difference and by the temporal nature of the structure and the meaning. I also combined CHAT and Activity Theory (I’m still not sure if they are the same or not). Unfortunately I will run out of colors soon, and without the ability to change the color of the text, I will be up against Popplet’s affordances again. However, I think I can make the connections and the distinctions more visible this way, and I am hoping that I will be able to “see” how the various theories interrelate, especially as ways to explain networks, using this new structure. I’m going to keep working on it this week as I continue to mull and connect. Need more driving and showering for more epiphanies. Lalalala Tour d’ANT – Feat. Bruno L. and Clay S.
Latour loves the metaphor of the ant — small, seemingly insignificant, myopic. And he takes it as an apt description of his much confused and maligned “theoretical” approach: Actor-Network Theory. Latour says there is nothing wrong with the term except the word “actor” and “network” and “theory” and the hyphen in between. He proposes more of an anti-theory of work-nets traveled by actants — a redefinition of what is described and how it is described. He wishes not to be boxed or contextualized or constructed in terms of others, as that is against the project itself. But it must be called something, so the insignificant ant, which becomes significant through its interactions with other ants, is an appropriate metaphor he embraces. So Latour wouldn’t study the ants themselves, but the paths they travel, the connections they make, the traces they leave, the relationships they foster. But then, how is that different than activity theory, which does a similar project, mapping the movement to various levels of interaction? ANT attempts to make the invisible visible, as does activity theory, but a fundamental difference is in what each theory takes as its nodes/objects. In activity theory, there must be a “thing” — an artifact, an interface, an object, a person, a structure. And by observing the interactions of these structures, the analysts determine the “how” and the “why” and deduce patterns and opportunities for optimization. Spinuzzi says activity theory a theory of “distributed cognition” (which smacks to me as a fragmented unity, with the assumption that there is such a stable unity), while ANT is an “ontology — an account of existence” (62). Spinuzzi notes that both theories are intersecting in work organization, which is interesting, but not surprising as ANT accounts for the movements of “everyday life”, which work (a hierarchical organized system) has now become an inextricable part of. What interests me most about ANT is that it attempts to account for the truly invisible and intangible actors — beliefs and knowledge — that affect the interactions that produce activity, perception, and reality of the actors. Latour says that the fundamental problem with other sociological theories is an assumption that there is “something else” behind observed interactions (they tautologically and reflexively call this the “social” or “society”), that the movement “from the local to the global and from the macro back to the micro” must be “the shadow image of some entirely different phenomenon” (171) that is theirs to unpack and reveal. I am struck here about how this may/may not play into Platonic thought (which Latour briefly addresses) as well as Jungian shadow theory. I don’t have time to ruminate about this now, but that is going to stick around for a bit. Can the two be reconciled or made to communicate? Anyway, Latour advocates removing this artificial notion of a third dimension called “the social” and flattening interaction to two dimensions. We should not seek to add a layer (a lamination??) to try to understand these phenomenon. Removing these “crinkles” in the 3D map and “ironing” it out on the table removes context and allows us to see what is happening. In addition, we have to give credit to the actors as being mediators and not intermediaries. They are not merely repeating or transporting knowledge and beliefs, but transforming them as they interact. Themselves. Too often, theorists add a “frame[work]” that, as Latour says, does not explain or add to the painting at all. Money concept: there is no individual and society existing as separate entities, one within the other or ranking above/below the other. Individual/society are two sides of the same coin, two ways of explaining the same thing. They are actor-network, with the hyphen showing how they are one concept, together. A moving construction of society is represented by this spinning yin/yang symbol. It isn’t quite right, though, because the Eastern conception of yin/yang is more a swirl, with the black and the white in movement with each other, sometimes more of one, not a false equality like it is usually drawn. expectations and align with goals. ANT would not, I think, allow for the primacy of the “situation” as an exigence. ANT would map the interactions and expectations without trying to understand why choices were made, only that they were made by the particular actor-network of that moment. The choices made become the movements to study, and the rhetor holds no more importance than others in the interactions. Latour would definitely, I think, not allow Bitzer, because in ANT something such as a “situation” as existing to be discovered by the rhetor does not exist. What exists are webs of relations that dynamically and continuously co-create generate the social and natural world we inhabit. I place the yin/yang symbol here because I think there may be a useful way to try to approach some of this discussion from a more Eastern (vs. Western) philosophical perspective. The Chinese symbol of yin/yang, imagined as a holistic entity divided into two halves that represent binaries — male/female, dark/light, good/bad, day/night, etc. However, the binaries are not strict–there is dark in the light and light in the dark. Nothing is all one or the other, and BOTH must exist simultaneously to have reality, balance, life, existence. The Cartesian mind/body split has further entrenched our notion of difference, that is recognized, but not divided in Eastern thought. A picture of yin/yang is never recognized to BE yin/yang, only something like a freeze-frame of a video. A capture of a specific moment in time, and the way the swirls were at moment. As soon as it was captured, it was lost, and if we were to build theories upon that observation at that moment, we would be incorrect. That seems to be part of what Latour is trying to say, although with considerably more pomposity and derision of those who disagree with him.